OK, I'll do it! I'll show you some very bad photos. In terms of quality. But unusual in terms of content. However, I've tried to take photos with Leo playing in the snow. Inside. In the living room. 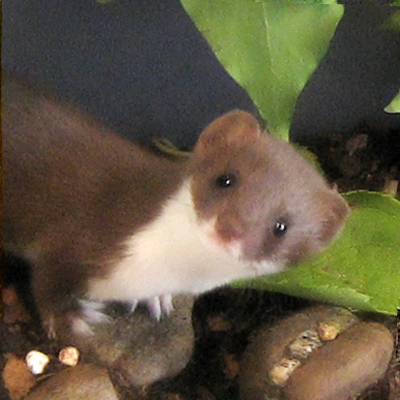 Weeks ago, I had read that least weasels can spend winter under the solid blanket of snow. Not hibernating (they don't do this) but living and hunting. Amazing, if you take into account that they have almost no protecting body fat. 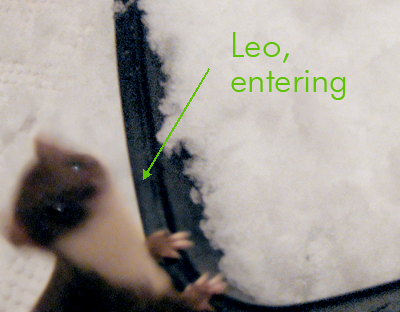 To prepare Leo for the wild I thought it to be a good idea to show him some snow. 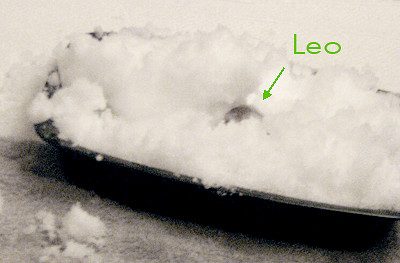 A few days before Christmas, when we had a lot of snow, one evening I got Leo a large tub full of freshly fallen snow. 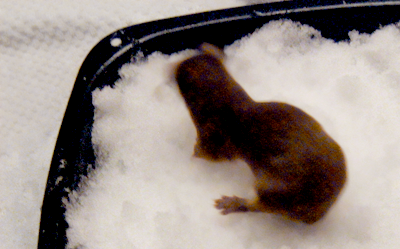 First he was very cautious, but because he is as curious as can be, he quickly gave this strange white stuff a try. What happened then was beyond every imagination. 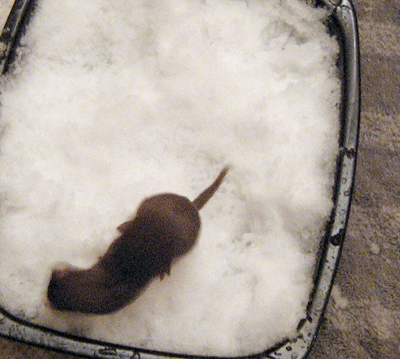 He jumped right into the middle of the snow, tunneled his way along the tub, leaped out of the snow at the other end with a squeak. 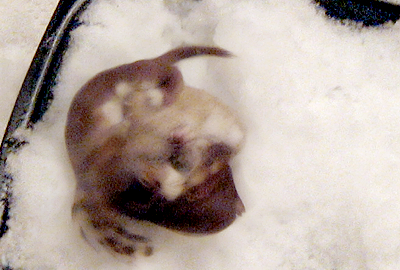 He jumped back into it again, dug through the snow, leaped out again coiling up into a small ball, bumping back onto the snow and starting it all over again and again, squealing with glee. Leo was delirious with joy. I had never seen him like this before. I had never seen something like this before. 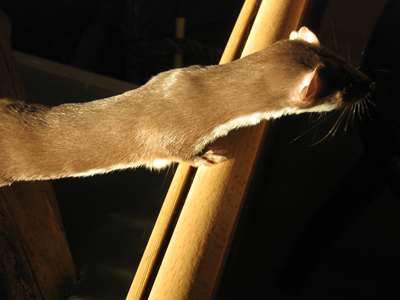 Weasel dance. In the snow. In my living room. In the warmth the snow started melting quite soon and I got Leo another fresh tub. And another one. And some more the following evenings. Leo was happy with all that snow. For whatever reason, I never shot photos of this. I only enjoyed watching him play. When the snow in the garden melted I realised I had missed a chance. At the beginning of February we again got frost and snow. 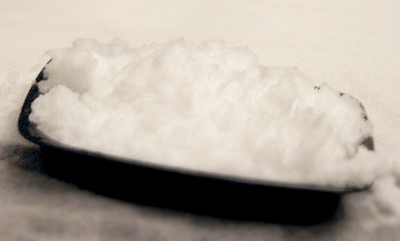 Just a little bit but maybe enough to please Leo again. I had to collect the snow from the garden table and bench but only got a small dish full. Enough for Leo to have some fun. This time I tried to take some photos. It was dark outside and just a table lamp lit the room. I did not want to frighten Leo with bright harsh light in order to get some better photos. So, here are these terrible photos now. 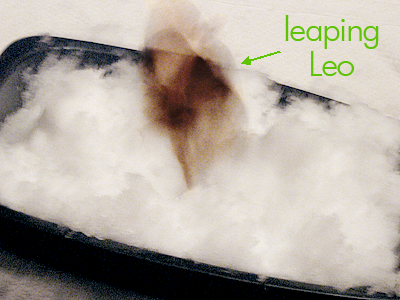 I do hope, you're able to catch a glimpse of Leo and his play in the snow. I won't leave you with just such photos. So finally here is a nice one showing Leo stretching at the rim of his cage. The German translation for 'being pleased as punch' is 'sich freuen wie ein Schneekönig', which literally is 'to be glad as a snow king'. And that's what Leo is.